I'll admit it. 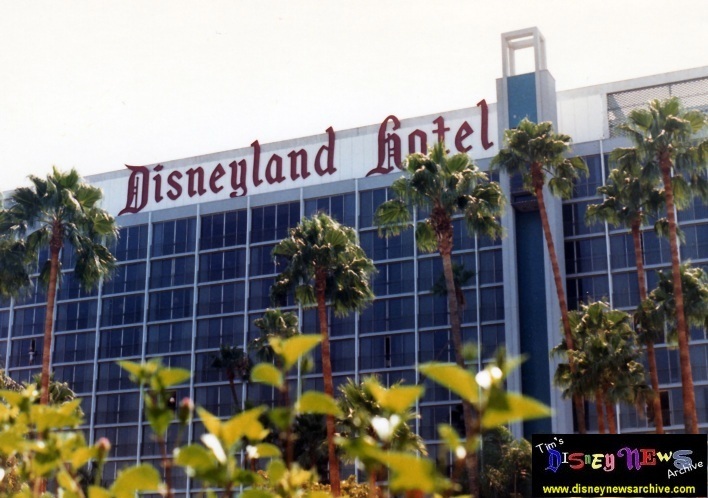 I've never really gotten over so much of the original Disneyland Hotel being torn out and replaced by Downtown Disney. Nostalgic memories of youth can be cruel that way. 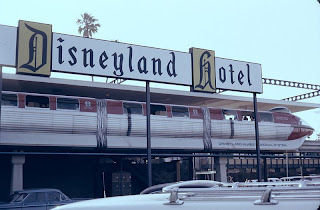 I miss the Olympic pool, the coffee shop, the garden rooms, the Monorail Bar--heck, I miss a Monorail station that was actually attached to the hotel. I even miss the ugly freight elevator in the breezeway that connected the front parking lot to the hotel grounds. 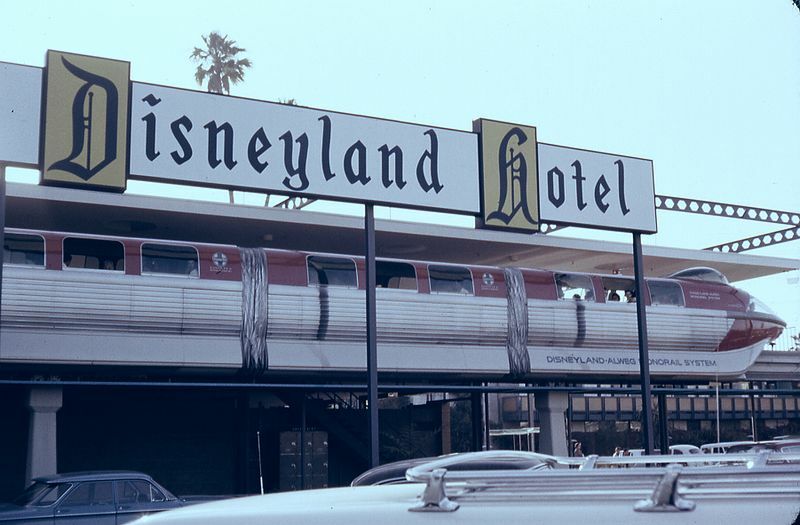 The Disneyland Hotel Monorail Station, 1963. Photo courtesy Robert J. Boser. As new renovations have been going on at the hotel the last year or so, I'm missing the original marquee sign at the top of the Sierra (never the Dreams) Tower--not to mention the balconies, the glass elevator and the Top of the Park. I don't think I like the blue windows that make up the hotel's new facade. The jury's still out on that. 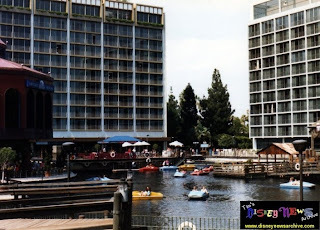 Yes, I know it's important for the aging DLH to stay up to date, and that the rooms themselves need some serious makeovers, but it's long sinced stopped being the DLH of my youth, one that I meticulously explored from the Travelport to the marina (who remembers the pedal boats?) to the Dancing Waters stage. 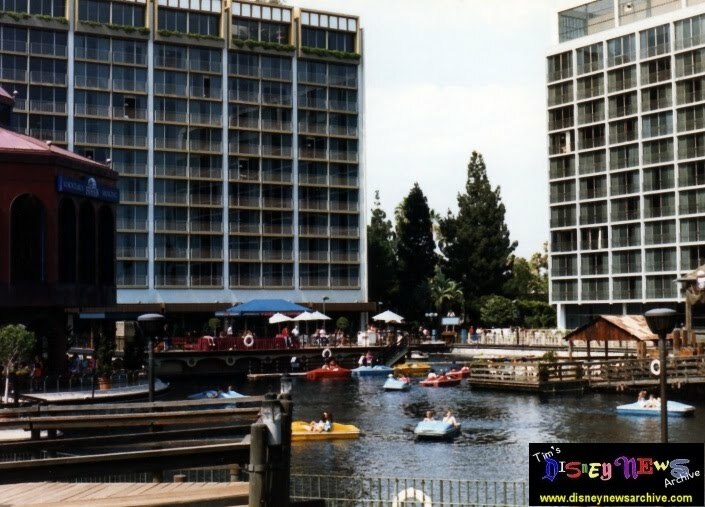 Pedal boats on the Disneyland Hotel marina, 1990. Yes, those are two scale replicas of the Mark I Monorail that stand at the head of two giant water slides. Atop the structure will be a sign reminiscent of the original Disneyland sign on Harbor Boulevard. The pool will be built adjacent to Hook's Pointe restaurant (adios shops and Lost Bar) and the Hook's building will be renovated in a Tahitian Terrace dining theme. There will also be an adventurous Jungle Cruise-type bar. The existing Never Land Pool area will be spruced up and remodeled in time for a summer 2012 reopening. The Sierra/Dreams hotel tower near the new dining area will be renamed the Adventure Tower and will be completed before the end of the year. The Wonder/Bonita Tower will be the next one redone when it becomes the Frontier Tower in 2011. Finally, the Marina/Magic Tower, which houses the registration lobby, will get its makeover and turn into the Fantasy Tower in 2012. Are you noticing a trend here? These are changes the kid in me approves of. I can't complain one bit about the DLH looking to the future by giving a nod to its (and my) past. Now, if they could just install an ugly freight elevator. What Makes the 'Toy Story' Movies So Good?